The aim is that Blackpool Sixth students receive high quality Careers Education and Guidance and have an opportunity to enhance their employability skills to enable them to make informed decisions about progressing into higher education, employment or training after completing their studies. We really value external support to enable students to gain information and experience to guide their decisions about their future. There can be many benefits to the employer too, as a student can bring fresh ideas to the organisation and there is the chance to meet potential future employee. So what is ‘Partner in Business’ at Blackpool Sixth? The ‘Partner in Business’ scheme is run by Blackpool Sixth to allow students the opportunity to link with local businesses and business people to gain valuable experience and knowledge of the work place prior to their leaving Sixth Form. It will also provide these students with transferable skills including producing successful CVs, interview techniques and how to demonstrate using professional standards in the work – place skills which are needed to succeed in the transition from college to work. We would like the student to experience first hand what the world of work can be like. This could be offering an internship over the summer, or work experience weekly. Volunteering opportunities are important to our students and we welcome the opportunity to support local organisations with fundraising and other activities. Why not be a mentor to one of our students? This could be a one to one meeting organised in college or a meeting set up in the workplace. Perhaps you could offer advice on CV’s or interview techniques? Having a support mechanism outside of college can really help to motivate the student and get them career-ready. We welcome your support at annual events. It is important to network with local employers to develop new links and provide ample opportunities for the next generation. We host a yearly ‘Networking Evening’ and a ‘Progression Evening’ to which our ‘Partners in Business’ are invited. 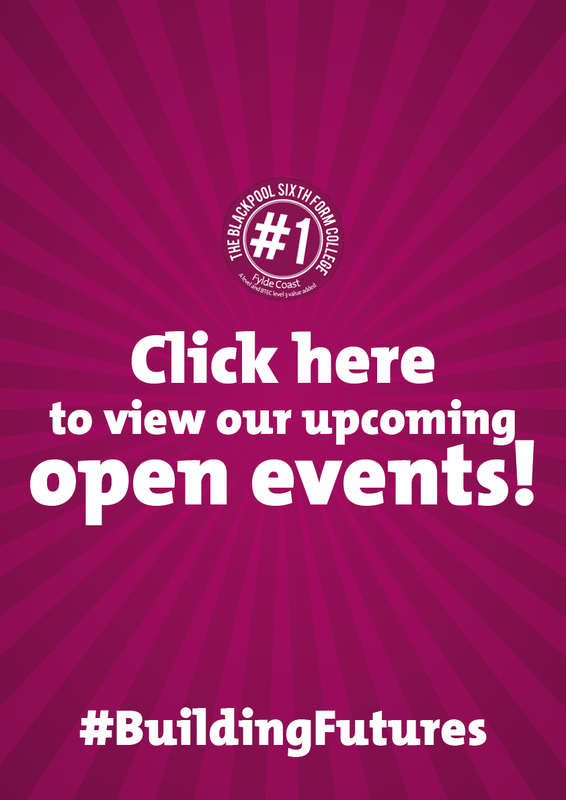 We would greatly appreciate your support at our forthcoming events. To view our calendar, please click here. You will be asked to complete a basic application form and a DBS Check (a legal requirement for working with young people). Employers who work with Blackpool Sixth are invited to complete a survey about your views of the college for Ofsted, the body which inspects schools and colleges. Please click here to complete the survey.